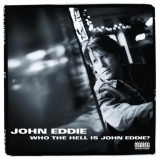 "So you think you can tell, Heaven from Hell, Blue skies from pain"
Who The Hell Is John Eddie? (this album) (2003). Sorry, no matches on eBay for "If You're Here When I Get Back John Eddie".